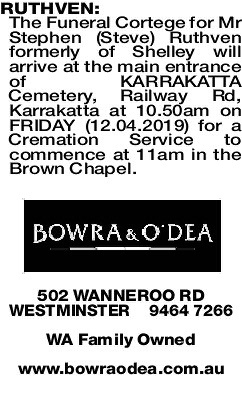 The Funeral Cortege for Mr Stephen (Steve) Ruthven formerly of Shelley will arrive at the main entrance of KARRAKATTA Cemetery, Railway Rd, Karrakatta at 10.50am on FRIDAY (12.04.2019) for a Cremation Service to commence at 11am in the Brown Chapel. Grace, Harry, Kaeleb, Tate and Ava. 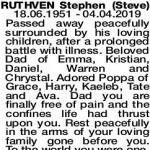 Dad you are finally free of pain and the confines life had thrust upon you. 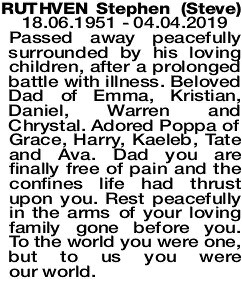 Rest peacefully in the arms of your loving family gone before you. To the world you were one, but to us you were our world.